The organ dates from the building of the new church, completed in 1702. Although the church is large, based on a Greek cross with small dome, and with a considerable acoustic, the organ stands in the nun’s choir, a much smaller room with a grilled opening to the church. 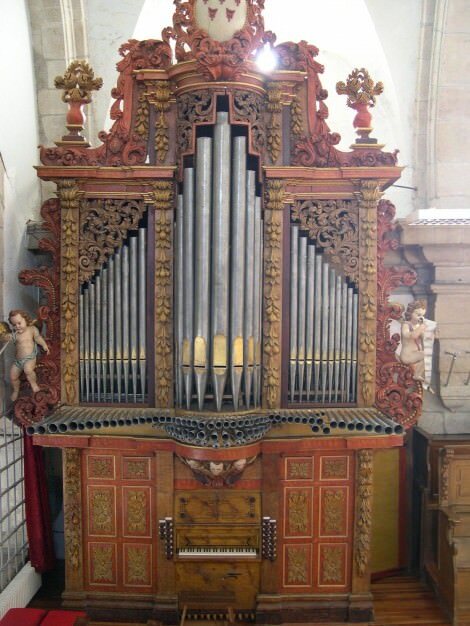 It was made in 1709 by Manuel de la Viña, who was working at the Cathedral at about this time. In 1865 it was rebuilt by a local builder, Ramon Cardama, who extended the key compass, with new chest, key and stop action, and provided a new bellows and wind system. He also extended the horizontal Trompeteria from the original Dulzayna to six half stops. In 1930 the organ was rebuilt by Fray Manuel Fernandez, a Franciscan brother, who replaced the key and stop action to provide a detached console with pneumatic action, a considerably extended and altered stop list, and new painting to the original casework. In about 1970, the organ was again rebuilt by a Franciscan friar, P. Antonio Montero, whose attentions included painting every pipe with silver paint. Between them the two friars polished the organ off. Our restoration work in 2003 has been a reconstruction of Cardama’s organ, based on the organ he built at a nearby convent of Dominican nuns. Cardama’s wind system has been restored. His wind chest has been restored and brought into line with the 1865 stop list. The keys and stops have been made new after the 1865 pattern, and fitted to the surviving stop jambs. The pipes required the most time-consuming and painstaking work, removing the silver paint, and numerous zinc beards and extensions, etc. Some of the reed shallots needed to be replaced and most of the tongues. Cardama was a very conservative builder, so this has turned out to be a classical Spanish organ. Compass: C –g³, 56 notes. The Corneta is housed in a swell box, with a lid operated by a knee lever.